With holiday festivities and winter breaks, Mark and I have fallen a few weeks behind in our regular reviews. Rather than attempt a thoroughgoing, comprehensive overview at this belated point, I’m just going to hit on a few salient characters, developments, ideas, and repertories that appear in the waning pages of the volume. After getting through the last little trickle of material, Mark and I will do some ruminating on the first leg of the journey (accompanied by a much-needed week’s vacation from the text) before we plunge ahead with Volume II. Pop Music around Europe: Every major national group in Europe during the 16th century started to develop their own idiosyncratic popular song forms for commercial dissemination. As Mark mentioned in his last review, the frottola was the preferred genre in early-mid century Italy. Likewise, the Germans had the tenorlied; the French had the “Parisian” chanson. Clement Janequin, a priest and chanson composer, was to music what Rabelais was the literature – a champion of the lewd, ribald elements of life. Many of his most famous pieces utilize a witty form of musical mimesis whereby the musical textures imitate real events (we’ve seen his before! ), such as the guns, screams, and bugles of warfare (La guerre). The great superstar of the 16th century, however, was the great musical polyglot Orlando di Lasso, who produced over the course of his career a startling 2,000+ extant works in every conceivable genre. Not only was he prolific; he was also incredibly popular, appearing in more anthologies than anyone else of the era. For a diminutive sampling, check out the chanson “Susanne un jour”; the Italian “low style” piece “Matona mia cara,” which features the botched Italian of a German soldier as he attempts to serenade a local gal (listen also for the delightful vocables “da da dum, ditty ditty dum..”); and finally, “Prophetiae Sibyllarum,” a setting of a mystical text that is chocked full of disorienting chromaticisms that would later be taken up by the madrigal composers and pushed to the absolute limit. The Madrigal: This repertory has grown especially close to my heart in the last term, as I just took a fabulous seminar on the subject with Susan McClary. I’m hoping to write more on this fascinating genre in the next week, but for the present purpose, I wanted to provide a very short Greatest Hits list of some amazing madrigals: Arcadelt’s “Il bianco e dolce cigno” (with its concluding tidal waves on “a thousand deaths” – we can guess what sort of “death” Arcadelt was talking about); Monteverdi’s “Ah dolente partita” (complete with a stirring musical representation of the painful act of parting from a lover in 0:10); also from Monteverdi, “Cruda Amarilli,” the madrigal that launched the infamous battle with Artusi that led to the theorization of the seconda prattica (the casus belli: an unprepared entrance on a MA9, at the time a dissonant interval [see 0:40]); Rore’s amazing “Dalle belle contrade d’oriente” (dig the Star Wars-style text on this clip! ); and Luca Marenzio’s “Solo e pensoso”, a hyperchromatic piece that pushes modal stability to the breaking point (the Marenzio chapter in McClary’s book is entitled “A Coney Island of the Madrigal”). The polyphonic madrigal was an Italian creation, but the form quickly spread northwards, finding especially fertile soil in England. The Catholics strike back: In an effort to staunch the bleeding in the wake of the Reformation, Catholic leaders launched a minor revolution of their own. Instrumentalists began playing a major role in church music, and the “concerted” style was the first to combine vocal writing with instrumental parts. Andrea Gabrieli and his nephew Giovanni were two early adopters of this approach. (See the younger’s magisterial “In Ecclesiis”.) This style led to a flowering of virtuosic writing for both voice and instruments (especially the cornetto, a oboe-like instrument with a cup mouthpiece like a trumpet) and a new level of theatricality. That’s how the Counter Reformation sought to get butts in the seats: wow the people with dramatic music. 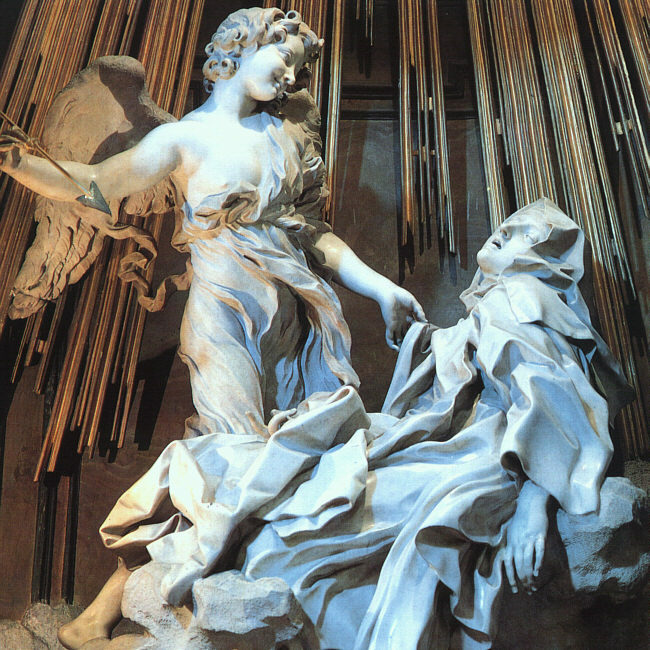 It was also during this time that mystical eroticism was embraced by the church, a stunning example of which can be seen in Bernini’s The Ecstasy of Saint Teresa of Avila, which depicts the mystic saint being pierced by the arrow of an angel. With our final reading review out of the way, expect more posts in the coming week. For follow Challengers: take next week off and rest up for the next volume. We hit January 11th. Congratulations to all who have been following along in the text and in the blog. One down, four to go! Today’s reading schedule brings us up to the 830th page (out of 834) of Vol. I. So hopefully readers will forgive me if I read ahead and polished off our first—and thickest—volume this morning. 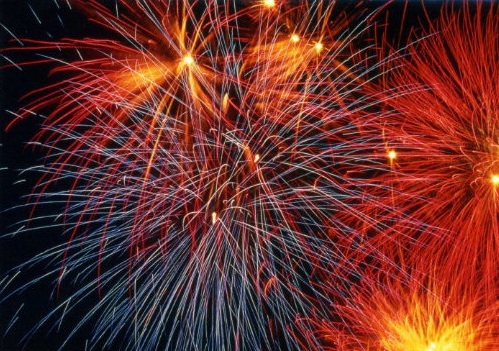 So much about being successful in a long-term project is counting victories along the way. So for those of you out there who are reading along with us, this is your chance to proclaim to the cyberworld that you have accomplished the first leg of this journey. Whether you are finishing the first volume the same day as this post, have finished it in the past, or finish months from the date of this post, let us know in the comments section, and we’ll celebrate with you. Here’s a performance of Carlo Gesualdo’s supremely strange madrigal “Moro, lasso” from the equally odd documentary by Werner Herzog, “Death for Five Voices.” If you want to see the most extreme manifestation of the Gesualdo myth, see this film: with psychiatric ward patients who believe themselves to be reincarnations of Gesualdo and Ferraraese parking lot attendents who swear that this spot in the lot was precisely where the mad composer killed his wife and her lover, the hysteria quotient is upped to a hilarious degree here. It does have some beautiful music in it, though. Our modern (mis)understandings of the past are not mistakes but the products of changed historical conditions. We value in Gesualdo something his contemporaries could not have valued, because we know what they (and he) did not – namely, their future, which is now our past. That knowledge can hardly be erased from our consciousness. “Matona mia cara” is one of the examples Taruskin give for his “Cosmopolite Supreme” Orlando di Lasso. This one is still quite popular, judging by the abundant number of video performances of it on youtube. The performances range from ten-to-a-part choirs to those that are one to a part. The following recording falls into the latter category. It is a well-sung and decently recorded performance (one of the reasons I use it here), but the humorous premise of the song (a German soldier singing to his Italian lady lover in botched Italian) is lost amongst the slightly drawn out performance. I like that it is not being performed on stage though. One can imagine these singers singing for Ferrante Gonzaga around a Mantuan hearth. You touch on it a little bit here, and I noticed this as well: Taruskin most definitely brings his personal historical (and aesthetic) judgment into the discussion of Palestrina and Byrd. It’s fairly clear that RT finds Byrd to be the more interesting of the two, and the adjectives from the text that you list above are all too telling. One of the blurbs on the back of the book calls the OHWM “highly personal (and often delightfully prickly)” and this treatment of Palestrina/Byrd certainly exemplifies that quality. He certainly doesn’t pull any punches when it comes to criticizing historiographical method, but I haven’t noticed this level of prickliness yet in regard to the relative strengths/weaknesses of famous composers and works. Of course, this probably just reflects my own relative lack of experience in music of this era. Scholars of 9th – 16th century music probably have plenty of bones to pick with this first volume. I was just preparing a post on these very questions, so I thought I would bring them to the fore of the blog. I’ll offer my thoughts below, and eagerly await other responses from Zach and our other many readers. “Byrd’s is the earliest music—certainly the earliest Mass Ordinary music—to have called forth such [hermeneutic] interpretations from modern critics, because his Masses and his alone seem to offer true interpretive readings of their texts. These are the kinds of reading’s ‘official’ settings like Palestrina’s do not encourage, precisely because they are official. That is, precisely because they are official they take meaning as something vested and given rather than something that arises out of a human situation” (683-684.). What we have in this case is Taruskin putting on his critic hat, and implying a value judgment in his direct comparison of the Credo sections of The Missa Papae Marcelli and Mass in Five Parts. The problem is that it stands in contrast to the tenor of the text: so far he has relentlessly harangued the “modern critics” (cited in the passage above) he now invokes as corroboration of Byrd’s value over Palestrina. And there is no overt indication in the text that Taruskin is giving opinion here or that he has switched hats. Even if we give Taruskin the benefit of the doubt and graft his pervasive skeptical view onto this passage, the damage has already been done. Readers (especially readers who have a tendency to boil nuanced arguments down to simpler formations—in other words, humans who are breathing) will come away with the strong impression that Palestrina was a cookie-cutter and Byrd was an artiste. The perfection of a musical style is tantamount to its destruction. For once a style has crystallized, it ceases to be a part of the dynamic flow of musical development, which is always in flux. Thus it was with the style for which Palestrina was the emblem and liegelord. In the generations immediately following Palestrina, church composers had to be proficient in two styles: the stile antico of Palestrina and the stile moderno, a concerted style which Taruskin will discuss in future chapters. In a section titled “Cryogenics” (perhaps the first such use of this metaphor in a musicological setting), Taruskin outlines how the Palestrina style was preserved by a string of treatise writers stringing from Johann Joseph Fux (Gradus ad Parnassum, 1725) to Knud Jeppesen (Kontrapunkt [Counterpoint, 1939]), which forms the basis of the modern study of counterpoint. Palestrina went from being the 17th century “papal staple” (667, RT just couldn’t resist on that one) to the 20th-century music student’s gauntlet to be run. Though William Byrd is held up as the English equivalent to Palestrina with regard to mastery of the ars perfecta, the personal religious and political implications of that mastery couldn’t have been more different. In the course of the 16th century, the Anglican Church was born, a new English liturgy was fostered, then suppressed, then fostered again. Catholics were persecuted under Henry VII and Edward VI, then restored under “Bloody” Mary, then tolerated under Elizabeth I only to be later persecuted again during her reign. It was in this ever shifting climate that Byrd, a confessing Roman Catholic, had to navigate keep both his professional career and his head. These personal and religious circumstances are important if we are to understand Byrd’s music, for it is the first of which in history that supports a hermeneutic approach, which in this case lead Taruskin to interpret Byrd’s music (Mass in Four Parts, Mass in Five Parts) as personal expressions of his faith in a hostile environment (see I, 681-686). This is in stark contrast to Palestrina’s settings of the mass Ordinary, which are “perfunctory,” based on sentiments that are “official” and a “given” (all words that Taruskin used to describe the comparison). To vastly over generalize/dramatize, Palestrina toes the company line while Byrd risks hide and head to be true to his beliefs. The C.O.D. of the ars perfecta has three components (all to be further autopsied in the final three chapters of this volume): 1) the commercial market’s demand for secular music; 2) religious unrest and reformation; and 3) “radical humanism”. Though the first generation of music printing (Petrucci) remained collectibles for the wealthy, Pierre Attaignant revolutionized it by inventing more practical (read: inexpensive) printing methods and driving the price of part books down. As a result, music making “increasingly became a vital social grace on par with dancing” (694). The frottola: This secular genre appeared in part books as an all-sung piece, as well as in a solo-voice-with-accompaniment form. Taruskin surmises the latter as the original and most prevalent one, vastly reducing the revolutionary aspect of the “monodic revolution” of the 17th century (698-699). The explosion of popularity of the frottola in print probably indicates that it had been (in oral tradition) the representative quattrocento Italian genre (696). The main proponents of the genre in print were Marchetto Cara and Tromboncino. Though Josquin’s “El Grillo” is the best known product of the genre today, it is unrepresentative. In next week’s review: the German Tenorlied, the “Parisian” Chanson, Lasso, madrigalisms, the archicembalo, and more!